If the Slipper Fits . . . In High Point Design LLC v. Meijer, Inc., [2014-1464], the Federal Circuit in a non-precedential, but still instructive decision, reversed summary judgment of anticipation but affirmed summary judgment of non-infringement of U.S. Patent No. D598183 on a Slipper. In reversing the district court’s finding of anticipation, the Federal Circuit said that “Design patent anticipation requires a showing that a single prior art reference is ‘identical in all material respects’ to the claimed design.” View the evidence in the light most favorable to the patent owner, the Federal Circuit found that a reasonable jury could have found that there was not clear and convincing evidence of anticipation. 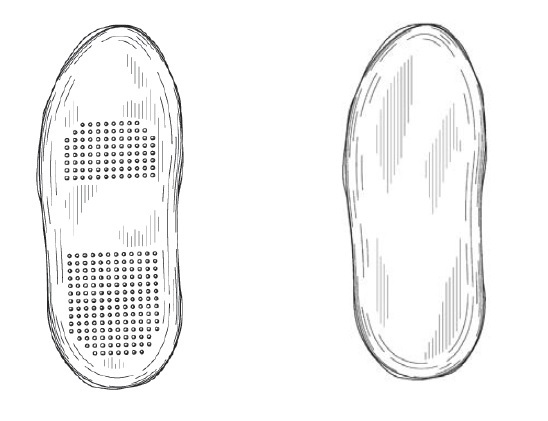 The Federal Circuit also pointed to differences in the soles of the slippers, resurrecting the infamous Contessa Food Prods., Inc. v. Conagra, Inc., shrimp platter case. While the Federal Circuit reversed the district court’s summary judgment of anticipation, it affirmed the district court’s judgment of non-infringement with a similarly detailed comparison between the accused product and the patent. Differences in the soles of the designs also factored into the determination. 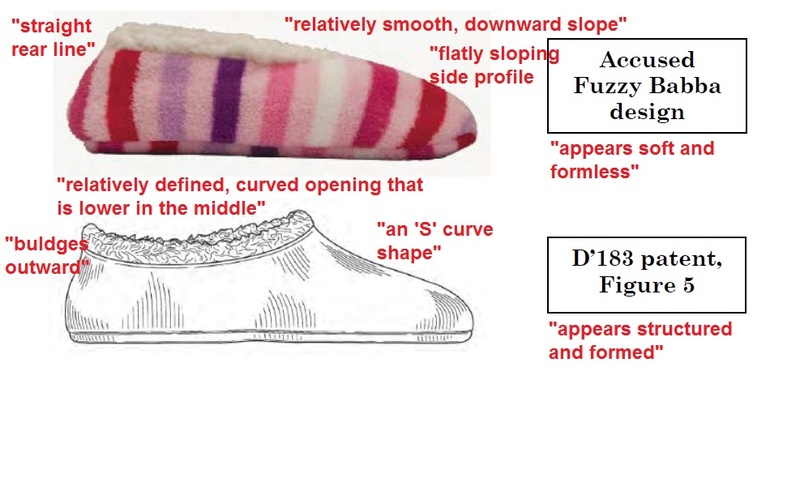 The Federal Circuit recognized that both designs essentially consist of a slipper with a fuzzy portion extending upward out of the foot opening, but said that such high-level similarities, are not sufficient to demonstrate infringement. Although not precedential, the opinion is instructive on how to compare designs for purpose of anticipation and for purposes of infringement. In Circuit Check Inc. v. QZQ Inc., [2015-1155] (July 28, 2015), the Federal Circuit revered the district court grant of JMOL, restoring the jury verdict that three patents on systems and methods for marking interface plates used in the testing of circuit boards were not invalid for obviousness. The Federal Circuit reasoned that by finding the claims nonobvious, the jury presumably found that the disputed prior art is not analogous and therefore not within the scope of the prior art, and concluded that substantial evidence supports the jury’s presumed finding. 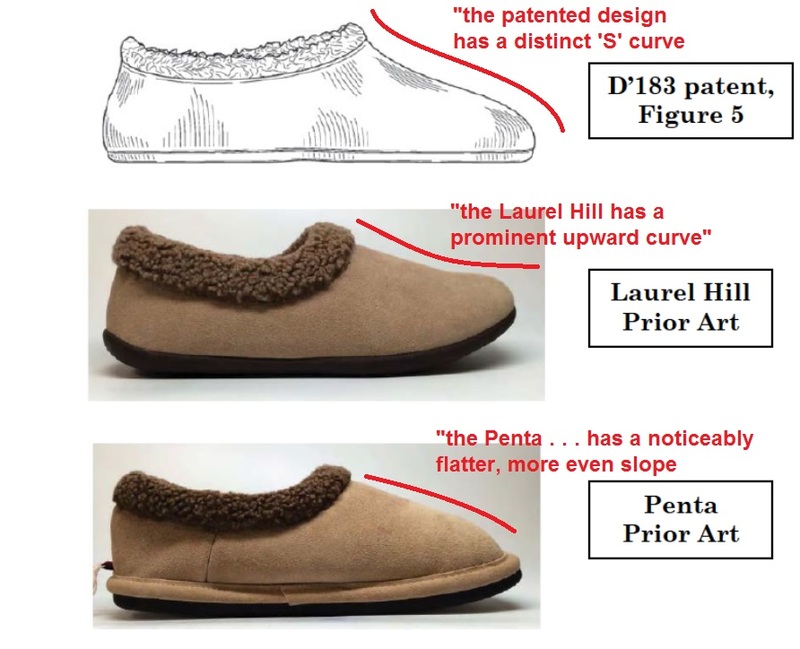 The Federal Circuit explained whether a reference is analogous art depends upon whether it is from the same field of endeavor or if it is reasonably pertinent to the particular problem the inventor is trying to solve. The jury heard testimony that a person of ordinary skill in the art would not have thought about rock carvings, engraved signage, or Prussian Blue in considering how to mark interface plates, and was entitled to weigh this testimony, find that an ordinarily skilled artisan would not find that the disputed prior art “logically would have commended itself to an inventor’s attention,” and thus find the disputed prior art not analogous. [a]n alleged infringer should not be able to transform all systems and methods within the common knowledge into analogous prior art simply by stating that anyone would have known of such a system or method. The question is not whether simple concepts such as rock carvings, engraved signage, or Prussian Blue dye are within the knowledge of lay people or even within the knowledge of a person of ordinary skill in the art. Rather, the question is whether an inventor would look to this particular art to solve the particular problem at hand. Even if the prior art were analogous, the Federal Circuit went on to find that a reasonable jury could have concluded that QXQ did not prove by clear and convincing evidence that the differences between the prior art and the claimed invention were insignificant. The Federal Circuit concluded that the jury’s presumed findings regarding the scope and content of the prior art, differences between the claimed invention and the stipulated prior art, and objective considerations of nonobviousness were supported by substantial evidence, and from these a reasonable jury could have concluded that the subject matter as a whole would not have been obvious at the time of the invention. Thus, the district court erred by granting judgment as a matter of law.